Queen Mother Amelia Boynton-Robinson celebrated her 101st Birthday on August 18, 2012, at the Eagles Nest, in Booker T. Washington High School, Tuskegee, AL. The Celebration included a Gospel Fest, with performers from throughout the Black Belt Region of Alabama. However, before celebrating, Mother Robinson got to work for Voter Rights. She participated in a Voting Rights March and conducted a Voter Registration Drive in Ridgewood Community, the largest public housing community in Macon County, Alabama. Mother Amelia Boynton-Robinson REVEALER Ed. 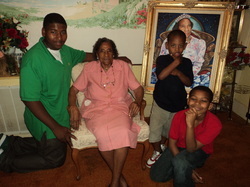 Queen Mother Amelia Boynton-Robinson was featured in the 2012 August issue of the REVEALER Newsletter. To get your copy, just click the picture or the title above. 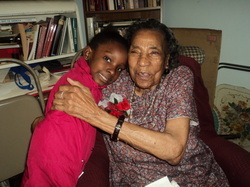 Queen Mother Amelia Boynton-Robinson was featured on the front page of the Tuskegee News, April 26, 2012. 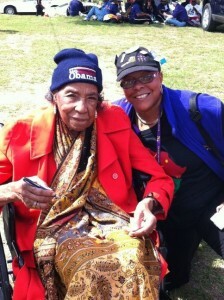 Queen Mother Amelia Boynton-Robinson participated in the 2012 Selma-to-Montgomery March Re-enactment, for Voter Rights. 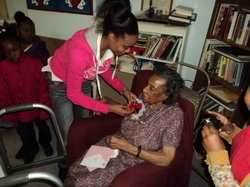 "I spoke with 101 year old Dr. Amelia Boynton Robinson. What an inspiration!" Queen Mother Amelia Boynton-Robinson was honored in an article for the Selma Times Journal on her 101st Birthday.